Amazon always puts its efforts for enhancing the selling experience of its sellers as well as with this privilege boosts the shopping experience for its buyers. Amazon opens a wide platform for all its sellers. The sellers can sell their products as the third party sellers by being Amazon central seller or can selle their products as vendors. 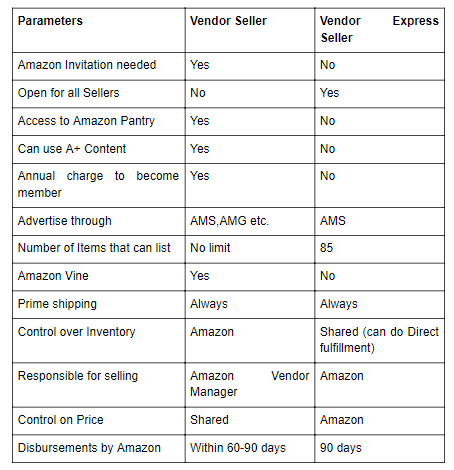 For vendors, Amazon gives two option- Selling as vendor central seller or vendor express. But both these are based on Amazon’s terms and conditions. Sellers can opt for Amazon central seller or Vendor Express. Being a vendor seller on Amazon is not everyone’s cup of tea. Only the sellers with higher sales volume and established reputation Amazon get the opportunity of becoming vendor seller, that too only after the Amazon’s invitation. Seller Central: By default, the new seller goes through this option of selling on Amazon. The selling through seller central is open for all. The seller here gets two options to become a selling member of Amazon. The seller can choose either a professional selling plan or an individual selling plan i.e.pay as you go or monthly payments to sell their items on Amazon. Vendor Seller: This is an Amazon invite to the established sellers on Amazon. The Amazon lists out the sellers with higher sales volume, buybox, ROI and with the good reputation on Amazon, then sends them an invitation to become the vendor seller on Amazon. By this invitation, Amazon offers the Amazon Marketing Services(AMS) to the sellers. Amazon buys their products and sells them as “sold by Amazon”. After buying from sellers, Amazon is totally responsible for promotion, shipment and proper delivery of the products to the buyers. The vendor sellers can avail the facilities of A+ content, EBC and sponsored products advertisements. Vendor Express: This option fits in the middle of Amazon seller central and Amazon Vendor central. As this is open for all. The sellers don’t need to wait for Amazon’s invitation. They can easily opt for Amazon vendor express and start their journey of selling on Amazon. The Amazon Vendor Express allows the sellers to sell their products directly to Amazon and get the products be displayed globally on the Amazon platform. Amazon purchases the products from sellers and then takes all the responsibilities right from shipping, merchandising and further customer services to customer returns. But it is to be noted that Amazon asks for few free products as samples to start selling your products on its platform with its tag “sold by Amazon”. Amazon gives the reason behind taking these samples as it needs to check the products selling before buying the products in bulk. When these products start getting the response from the customers, Amazon would definitely buy more from the sellers. 1. Free: Firstly, it is totally free. The sellers don’t need to pay any membership fees to Amazon. 2. Increases sales volume: Amazon buys the products in bulk from the sellers. This increases the sales volume of the sellers. The higher sales volume helps the seller to win the buy box. 4. Free shipping: Once Amazon has bought your products, you don’t need to worry about the shipping from Amazon’s warehouse and to the customers. The Amazon itself handles the shipping process and forwards the products to customers from its inventory or from you and that too without involving you. Wow...good deal for a vendor express seller. 5. Available for prime shipping: When Amazon purchases products in bulk, it can add your products for prime shipping. This means that customers can receive their products within 2-days of their orders. As quickly customers receive their orders, more they become happy and satisfied with your products and Amazon services. Definitely, this leads to drive the sales of your products. When your products get more sales, Amazon would be going to buy more products from you. 6. Chances to win buybox: More the sales volume, more will be the chance to win the buybox on Amazon. 7. Access to AMS: Sellers can utilize the Amazon’s Marketing services(AMS) to promote their products. No charge yet can be expensive: Wondering!! But yes it is true. Surely Amazon does not incur any charges from seller to be a vendor express seller but it more often asks the seller to give their products as free at the starting of the vendor express. If you are selling the local products or the smaller products then it can be bearable not having the profit initially. But when you deal with the expensive products, and then Amazon asks you for free products as samples, it will definitely kill your profit. No price control: When Amazon buys the products from you, it gives an agreement to purchase your products and decides the prices itself. When you negotiate the pricing, fewer the chances of $1 that Amazon changes its price. Lesser pay: Amazon pays you lesser than other retailers. You need to sell more products but still, you would lack in earning your targeted profit. Thus being a Vendor Express seller is something equivalent to chew the few perks of Vendor Central and that too with the seller’s choice only. But once you become vendor express seller, Amazon controls more on your products than you. It controls pricing, marketing, shipping. You don’t have further rights to decide the selling prices. Yet it gives more chances to have higher sales that give you the opportunity to win the buybox. It is up to the seller to whether to seller central, Vendor central or vendor express. With any type, you would be an Amazon seller. Congratulations! !